Cuthbert, Ga−Short and Paulk Supply Company of Tifton, Georgia has opened a new store in Cuthbert, Georgia, at the former H&H Hardware location. This building was originally built in the early 1930’s for a Coca-Cola bottling plant. H&H Hardware later acquired the location in the early 1980’s. H&H Hardware served the Cuthbert community for the past 36 years. Short and Paulk has done extensive remodeling to the building. The showroom has been more than doubled in square footage and many new products have been added. The new location has been opened for business since early April, but the Grand Opening will be held on May 25, 2016. Over the next few months, according to Mr. Short, the Cuthbert store will add 5-6 new jobs and expect to employ 7-10 employees within the next 2 years, most of which will be filled with people from the local community. Short and Paulk began when JP Short II moved to Tifton in 1910 to work with his brother-in-law Jack Taylor at Taylor Hardware & Furniture. In 1917, he and his wife Linda opened Short Hardware on Main Street in Tifton. JP Short III took over the store in 1932 after the deaths of both of his parents. JP operated Short Hardware through the depression until 1939. 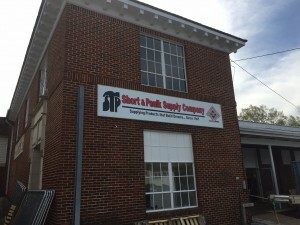 After a short stint at Rodenberry’s Hardware, JP and his Uncle HP Paulk founded Short and Paulk in 1941 in an old warehouse along the railroad tracks on South Main Street in Tifton. Short and Paulk’s first phone number was only 97. The company has always sold building materials, but in the early days, it was also heavily involved in the agricultural supply business, selling tractors, farm implements, feeds, seeds, and fertilizers. Short and Paulk was also a distributor for Diamond-T trucks. Today third generation family member J.P. (Jay) Short V serves as President and CEO. Short & Paulk currently operates 5 Lumberyards – Home Centers, Short & Paulk in Tifton, Sylvester, Albany, Dawson, and now Cuthbert. In addition, the company operates Georgia Structural Components, a truss manufacturing plant in Tifton, and a door assembly shop in Tifton. Short & Paulk currently employs over 70 full and part-time employees. A fleet of trucks delivers building products to jobsites all over South Georgia, North Florida, and Southeast Alabama. At Short & Paulk we supply products that build dreams.